Arizona Rural School's Association is dedicated to promoting quality education for all students in rural Arizona schools. 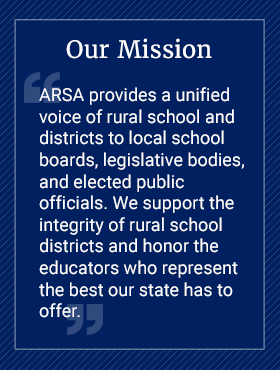 ARSA provides a unified voice for rural schools to legislative bodies, policy makers, and elected public officials. We support the integrity of rural school districts and honor the educators who represent our rural schools and communities. If you serve Arizona's rural students, membership in ARSA will give you the opportunity to add your voice to that of rural educators across Arizona. Please join us for our March ARSA superintendent's round table interactive webinars by Dr. Melissa Sadorf and Mr. Sean Rickert of your ARSA executive board on Tuesday, March 26 from 10:00 to 11:00 a.m. Please visit our News page for more information. Enjoy a special edition of the Rural Scoop with a member of the Arizona Rural Schools Association, Dr. Howard Carlson. Please join us as we celebrate our 25th conference anniversary in the cool pines of Flagstaff, Arizona.